We offer a variety of ways that a SaaS company can display the Cyclr application and let users ‘turn on’ or activate the integrations. You can either choose to completely design your own ‘skin’ or you can use some simple, brandable, components that we have already built. 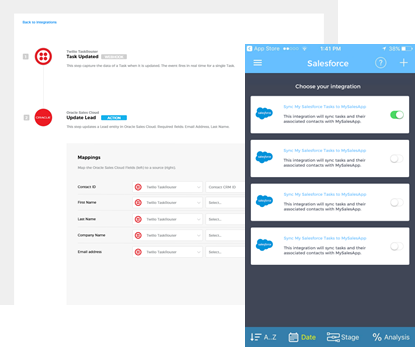 Our flexible platform allows you to deploy native integration in one of three ways. Our integration platform can be used as a white labelled integration solution to directly provide integrations and automations to your clients. Simple, but effective, you can offer a branded and bespoke menu of integrations, accessible from within your application. By building a bespoke UI/UX on top of our own API you have complete freedom with where and how you want to present your integrations to your users. This flexibility allows Cyclr to be deployed in a wide range of types of applications, including SaaS platforms and mobile apps. This flexibility allows Cyclr to be deployed in a wide range of types of applications, including SaaS platforms and mobile apps. LAUNCH is Cyclr’s integration deployment feature that enables a super-simple set-up process for end-users and removes the need (should you choose) for you to deploy any UX. LAUNCH gives you a trigger based setup that runs on top of your application.